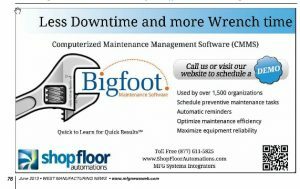 Check out our ad on Plant Maintenance Management Software (CMMS) from Bigfoot in the June 2013 issue of Manufacturing News! See our ad! What is CMMS Software? Otherwise known as a “computerized maintenance management system”, a CMMS is a system used by maintenance departments to keep track of preventive & predictive maintenance-related tasks & asset history. Schedule PM’s, track repair costs, assign work orders, manage purchasing/inventory, & run trend analysis reports. In addition, you can manage spare parts inventories, track safety events, & manage OSHA required documents. Read more below. Maintenance departments are often stretched very thin these days, so staying organized is essential. Get scalable CMMS configured for any size business & can even be accessed on a mobile app. Our CMMS system solution below means less unplanned downtime, minimizing operational costs, & optimizing your maintenance staff. Keep organized & reduce downtime – Automatic reminders prevent PMs from falling through the cracks, which reduces equipment downtime. Save time – Request form saves maintenance department one hour per day by not having to field or respond to calls or emails for non-emergency maintenance requests. Reporting – Identify what work has been done on equipment over time & what’s overdue. Analysis – See how much it costs to maintain a piece of equipment over time, when it’s down, & why. Bigfoot CMMS also recently released a native mobile app – they are one of a few CMMS providers that has a true app for smartphones & tablets today.